Why Do it? 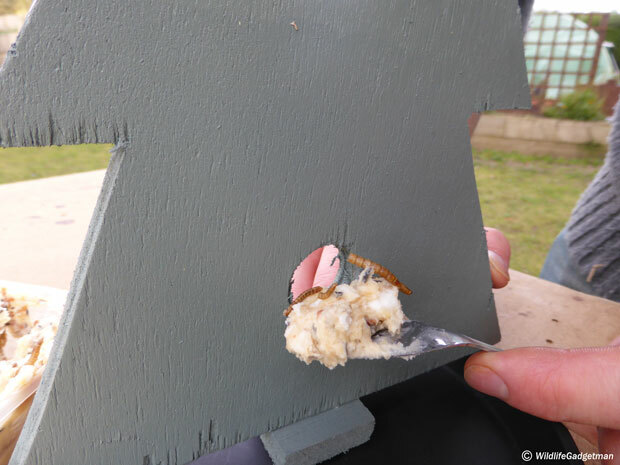 : Feeding birds in your garden any time of year is a great way to help wildlife in your area. It’s especially important as we get into the colder months of the year and natural food sources become more scarce. What you Need: 12mm Exterior Ply approx. 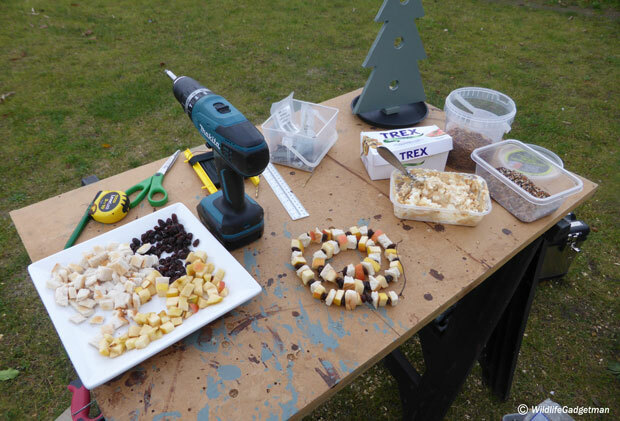 200mm x 300mm, (x1) Plastic Plant Pot Drip Tray, string, Vegetable Fat/Peanut Butter/Birdseed Mix, A Slice Of Stale Bread, An Apple, A Handful Of Raisins, Green Paint. 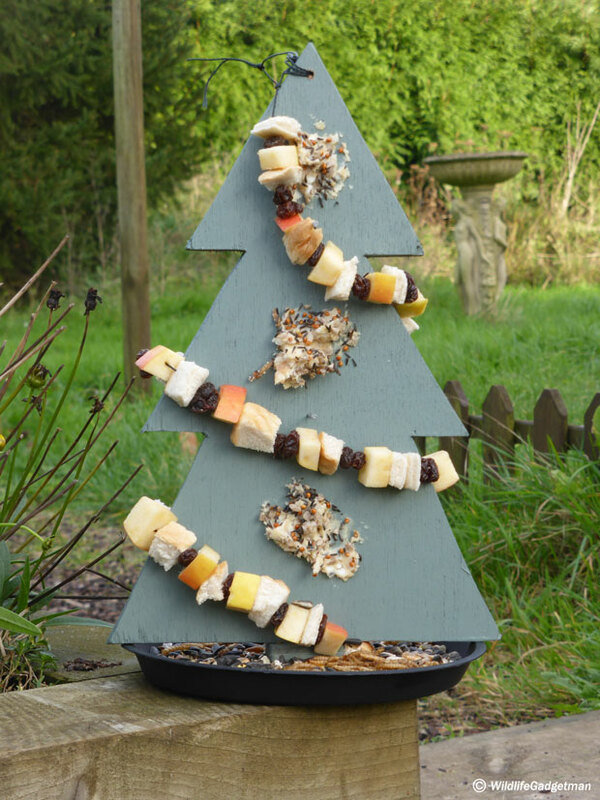 As Christmas is fast approaching and the threat of colder weather is on the horizon, why not have a go at making a festive bird feeder shaped like a Christmas tree?! They are very easy to make. A perfect activity to do with the kids over the Christmas period! Collect all your materials together. 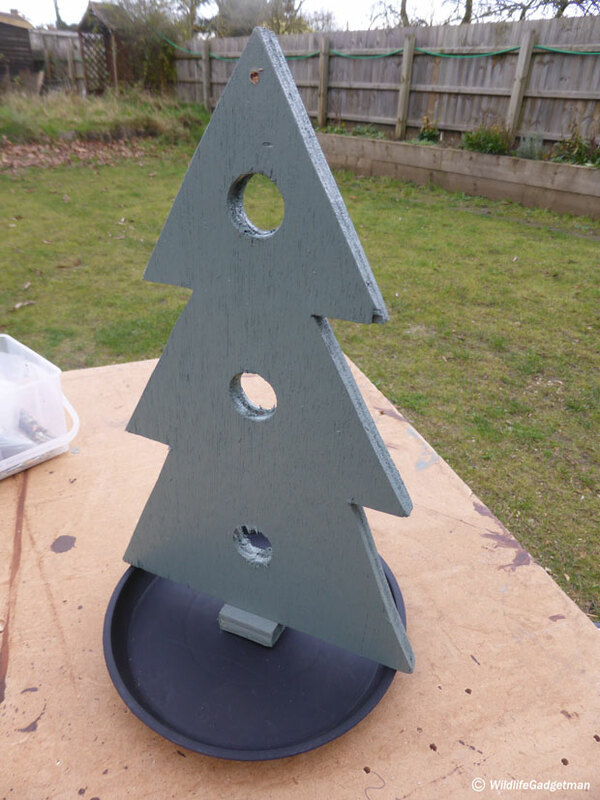 I’ve used a scrap of 12mm thick exterior plywood to create my Christmas tree shape. Cut out the shape of your Christmas tree and sand the edges. Drill several random holes (no larger than 30mm diameter) through the Christmas tree (I’ve drilled three in mine). We’re going to stuff them later with our fat/seed mix! Drill another hole approx. 4mm near the top point of the Christmas tree. We’re going to use this to attach our hanging loop. 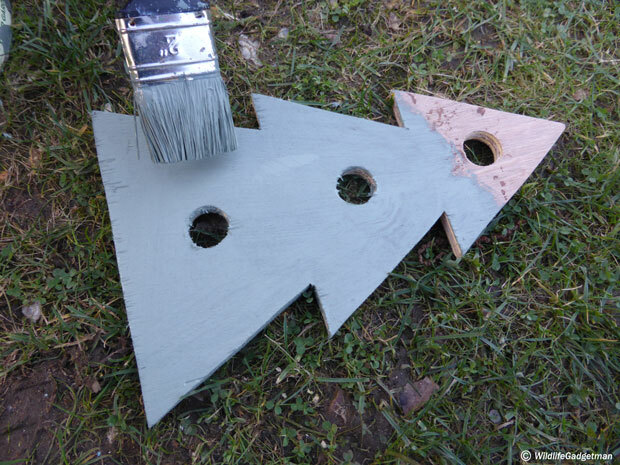 Paint all sides of your Christmas tree green and leave to dry. 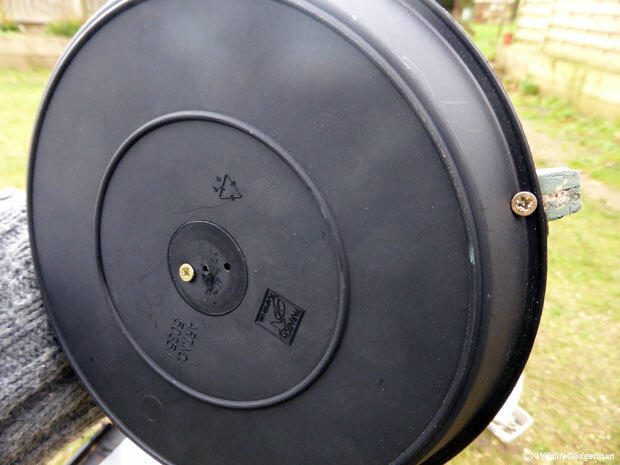 Fix the plastic seed tray to the base of the Christmas tree using three screws. I’ve also used a small piece of scrap wood to add a little extra support in the centre. Mix a small amount of unsalted peanut butter into a pack of vegetable fat. 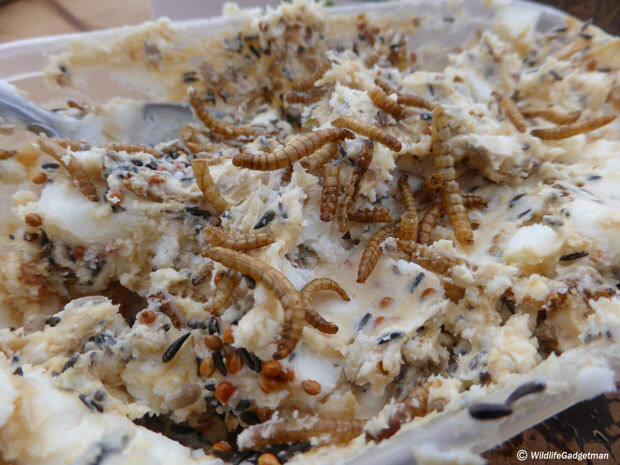 Add a small handful of bird seed and a pinch of dried mealworms. Mix well. 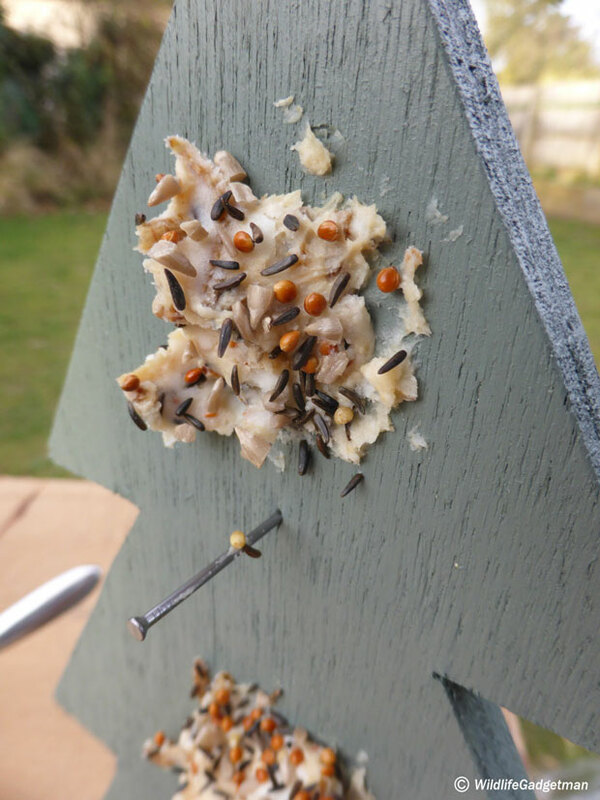 Fill all the holes you drilled (apart from the small one for the hanging loop) with the fatty seed mix. 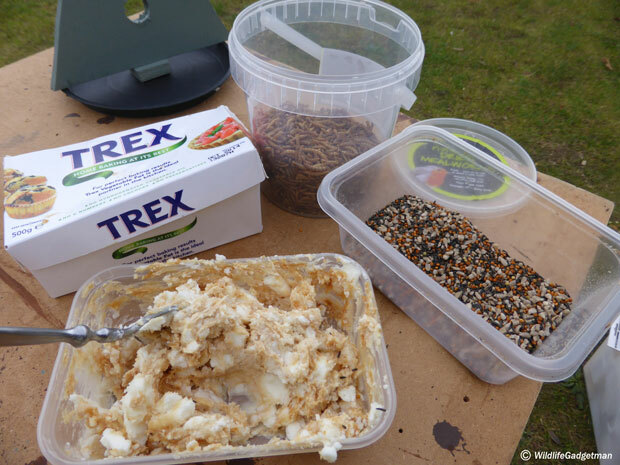 Sprinkle some extra bird seed over the fat mix. 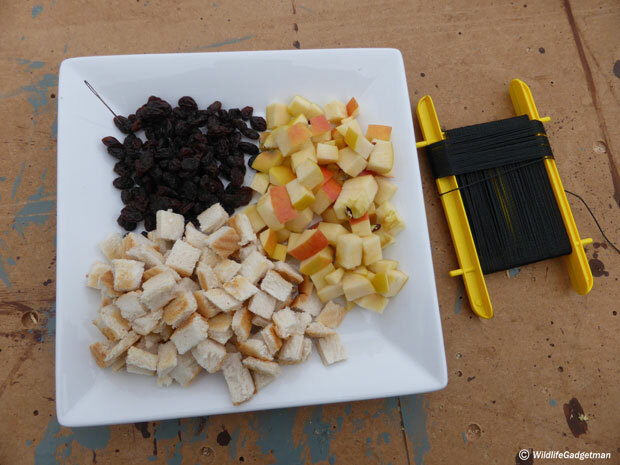 Start by grabbing a handful of raisins and chopping a piece of stale bread and an apple into small cubes. Cut a piece of thin cord, string or wool to 450mm long. 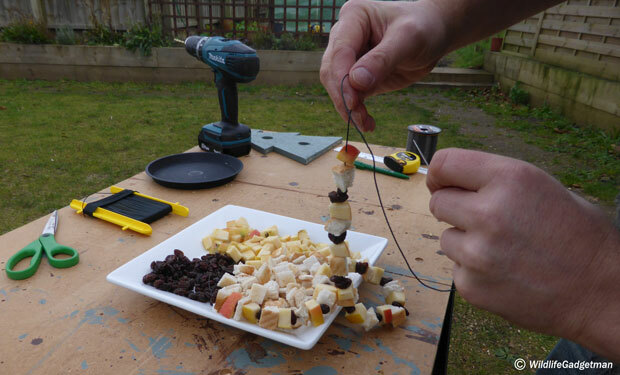 Using a crochet needle or similar thread your pieces of bread, raisins and apple onto the string. 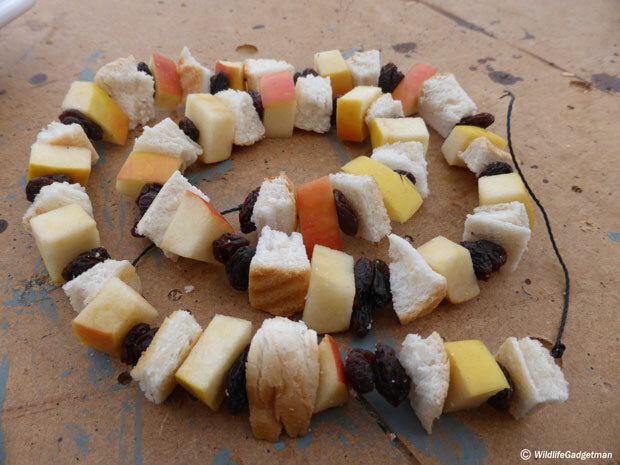 (Tie a knot in one end of the string before you start so the bread, apple and raisins don’t fall off the other end! Continue threading the pieces on alternately to create a nice pattern until you reach the end of the string. Tie one end of the garland through the small hole you drilled for the hanging loop. Then twist the garland around the tree until you reach the bottom. Tuck last couple of pieces on the garland under the tree to hold it in position. Fill your feeder and hang it in a tree! Thread a short length of string through the small hole at the top of your Christmas tree. Tie the ends together to create a hanging loop. 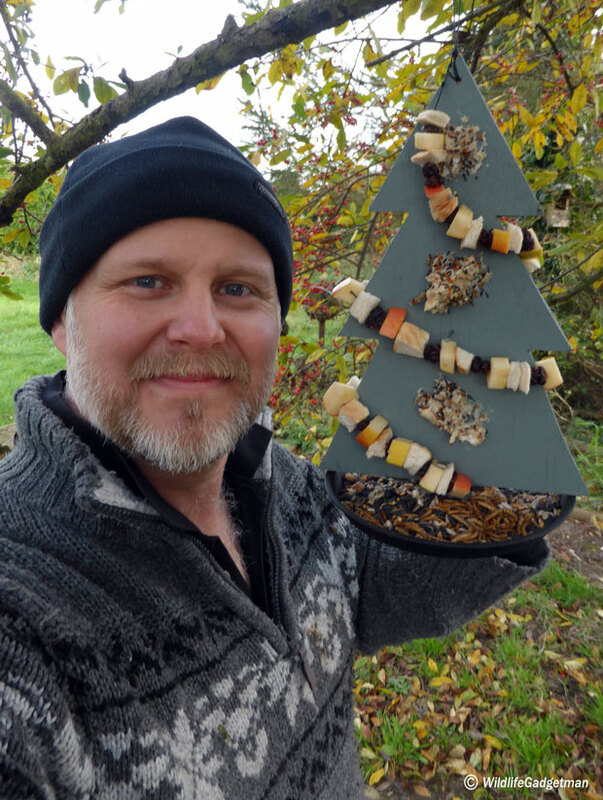 Fill the seed tray with a good bird seed mix and hang your fab creation in a tree. It won’t be long before the birds start arriving to see what treats you’ve put under the tree for them!